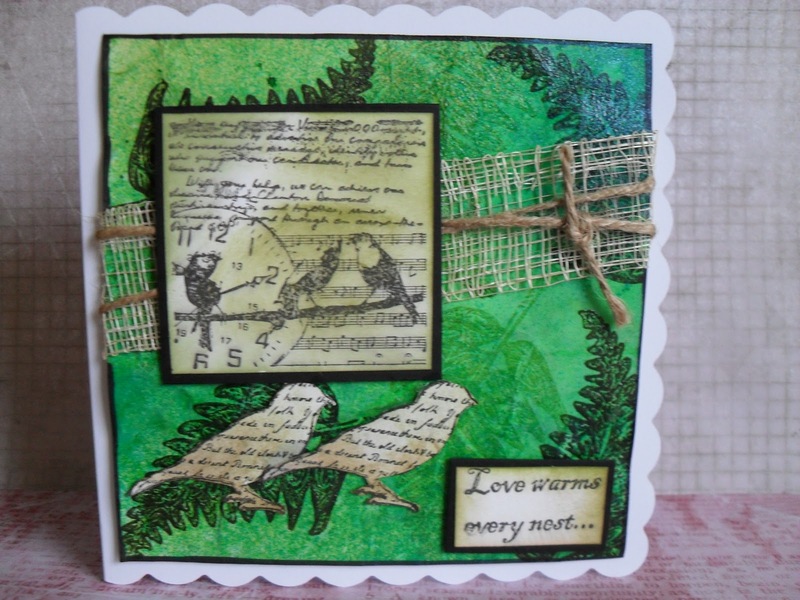 I've been having a look around on Feline Playful again and have found another interesting Challenge Blog, called The Cheeful Stamp Pad, Their challenge this week is "Birds of a Feather". Having just bought a Papermania Urban set of stamps, the stamps not even yet put away. I set to and made this card. The background was first blended with Bundled Sage and Peeled Paint. Sprayed with Cosmic Shimmer, Meadow Lush and Peacock Green. I stamped the leaves randomley with Bundled Sage and Forest Moss, used clear E.P. Secured the mesh and garden twine. Stamped and secured the images. Sentiment is from Creative Expressions - Birds Plate. Selection of TH Distress Inks as mentioned above. Super cards, don't you just love wax crayons there is so much you can do with them, why did no one tell us when we were children? Stunning card and really interesting techniques you have used. Wow, your card looks fabulous, love the fresh green, the images and all. Fabulous colours Caz, I love the design and stamps. This is a fantasic card - love the birds from text paper. Thanks for joining our Birds of a Feather at The Cheerfl Stamp Pad! Great card! I love it how you've put in so many different textures. Beautiful card---great elements. Thanks for joining our "Birds of a Feather" Challenge over at The Cheerful Stamp Pad! This is lovely. I really like your card. Thanks for joining at "Birds of a Feather" at the Cheerful Stamp Pad. Sketch -LIM-1 for a guy. Is there a Blogger problem? The Postcard Challenge 2012 has started!